Minecraft is now more than just a game for building awesome virtual worlds. These days, many people use it for studying language, quick virtual world modelling of something they are about to build in the physical world, or as a communication bridge between friends and community. 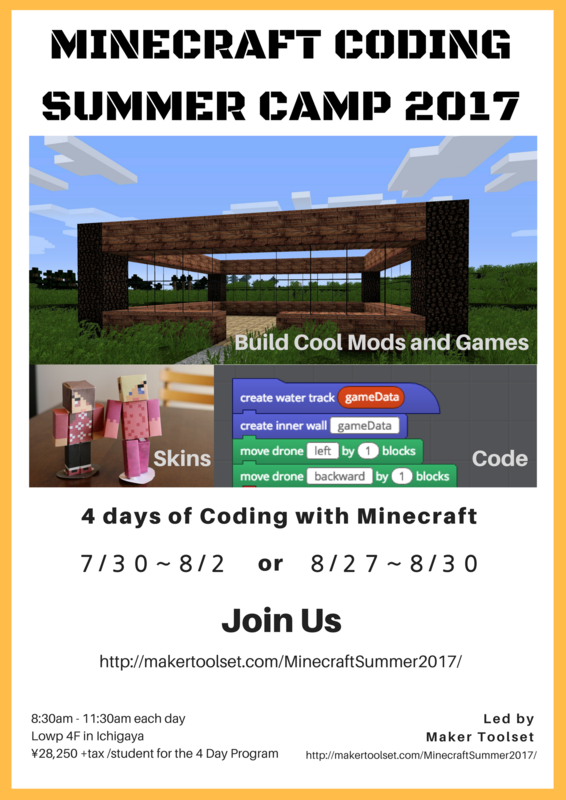 Starting July 30th, or Aug 27th, Maker Toolset’s Summer Camp 2017 students will learn how to do build cool Mods and Mini Games while using block-based coding within Minecraft. 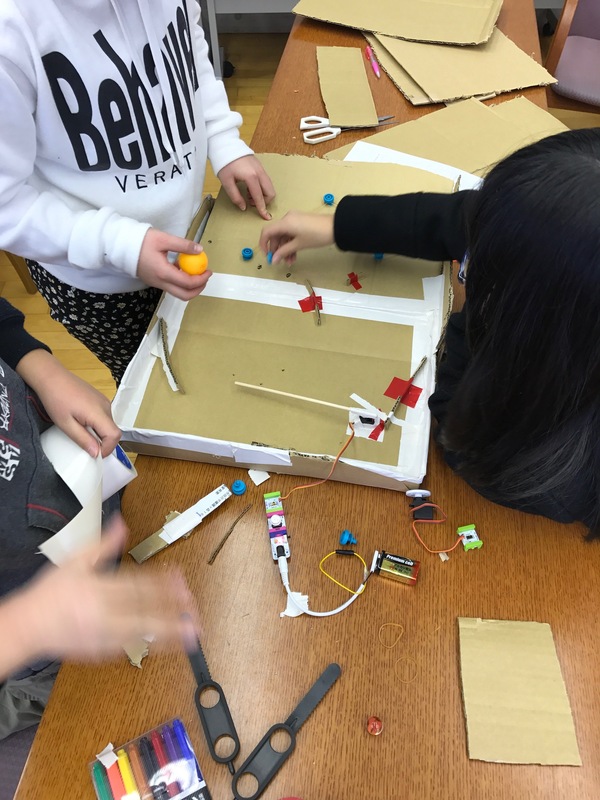 Between each coding session we have some physical building challenges with design cutters and cloud connected electronics that challenge students’ imaginations and build their creative confidence. This 4-day camp is designed for students with the desire to learn coding and English purposefully through the fun of a virtual world game. 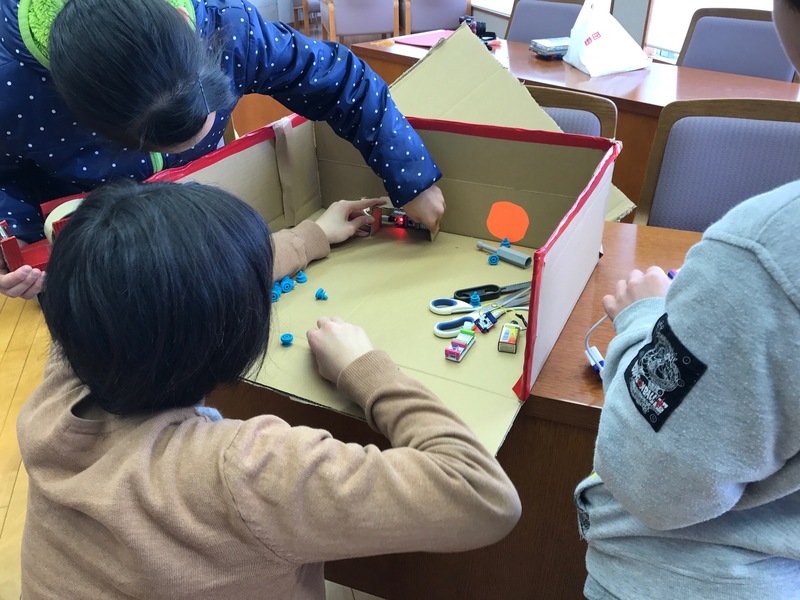 All mentors are bilingual so even Japanese speakers who are new to English will find a practical hands on opportunity to communicate with classmates. Enjoy and learn with us whether you are a beginner to computers and want to learn how to code for the first time, or are already on your way to higher levels. There will be lots of fun and new challenges to fit your level. Day 1 – Get an introduction to Minecraft and what it means to “Mod Minecraft.” Understand the environments of the simulator and your own private minecraft server. Introduction to functions, world edit commands, drones, and enemies/mobs. Day 2 – This day will require you to be unafraid of failure by using trial and error to learn the basics of coding. All we need is your growing logic skills and a bit of patience. Pick a Level 1 challenge and the code modules will guide you through the rest! Day 3 -You will now control the game through code. 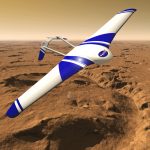 Building with the drone tool: discover the incredible power of the drone tool as you build massive or complex structures with ease. Combine building with the drone tool with the power of functions and loops. Make the game do what YOU want; at a keystroke. Day 4 – Make basic games in Minecraft by customizing a Spleef style game. Your personal project mod or game will use all you have learned during the summer camp. 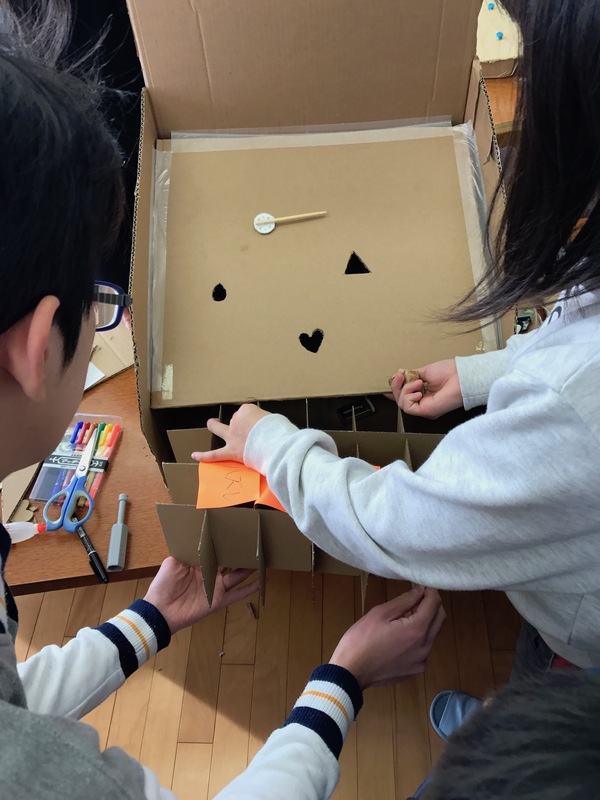 Once your project is done, share and test others classmates creations. 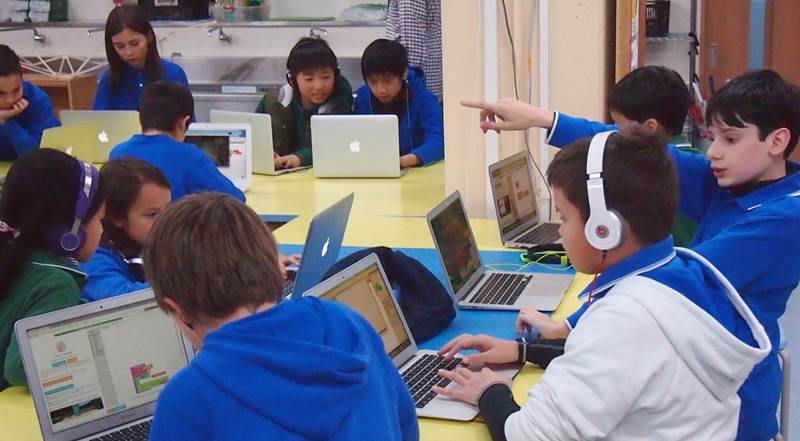 Minecraft is a relevant learning medium for any age. 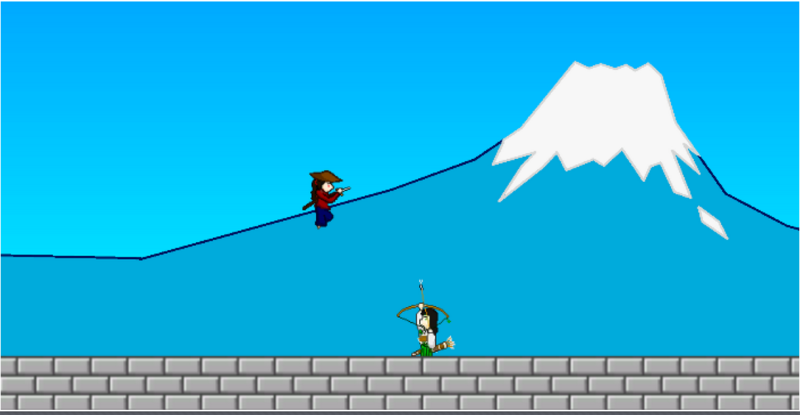 Due to popular demand, we have created a two track system for students to be able to collaborate within their age group and at equivalent levels and speed. 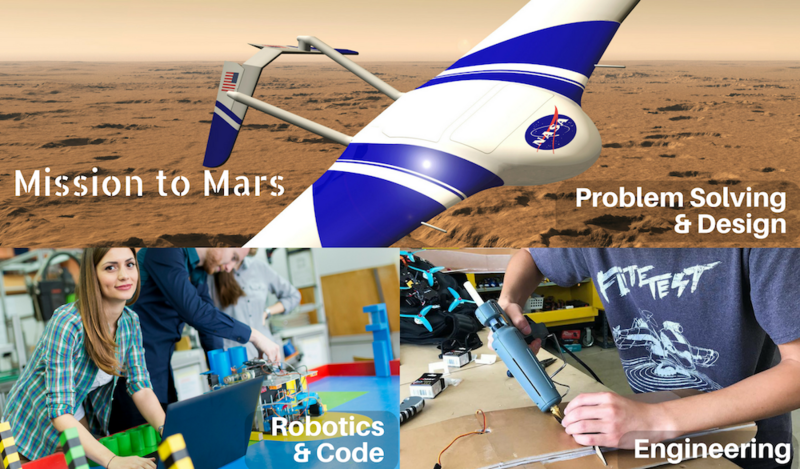 Jr. & Sr High School Track – includes more time for higher level challenge cards and option to experiment with cloud connected electronics to do IoT style connections between virtual and physical worlds. Wow, we made it! 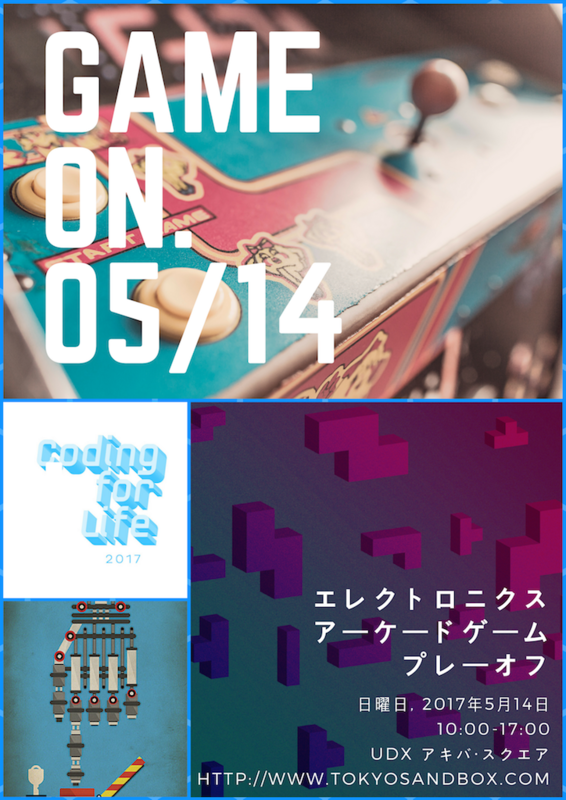 The super successful first annual Electronic Arcade Game Playoffs was a brilliant highlight to the Coding for Life event of Tokyo Sandbox 2017. A huge thank-you to Kevin Lim of Tokyo Sandbox for his confidence in us to put on a show that was remarkable. Additionally, a full round of applause to all of you, the students who demonstrated your creativity, hard work, and persistence to conceptualize and deliver on your ideas! Please remember to individually thank your teachers who gave up many afternoons and weekends to get behind this project to provide a very unique and authentic learning experience for us all. 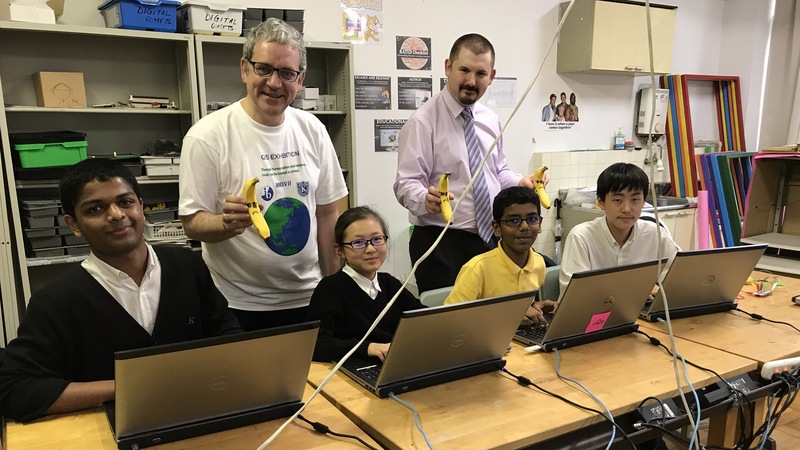 A wonderful surprise was the extraordinary support from the volunteers at Tokyo Sandbox as well as the team from YouMeWe who will be putting all the proceeds from token sales into their Digital Literacy Project with children living in institutionalized homes. Your efforts will make a difference in the life of underprivileged children in Japan. A quick summary of the overall event summary in infographic format below. Due to the misreading of a 1 as a 4 during the announcement of winners, we have corrected our mistake and offered even more prizes for the excellence shown by students. 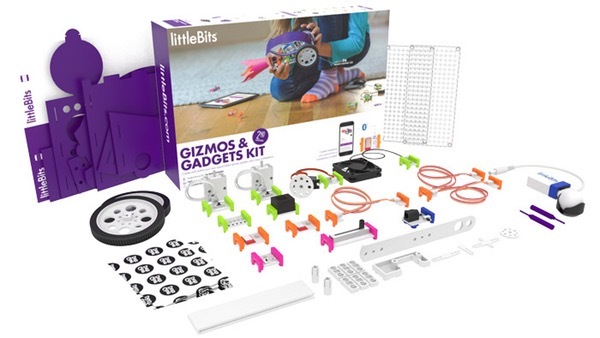 To wrap up, the Grand Prize winner of the littleBits Gizmo and Gadgets kit was K-IST coders. 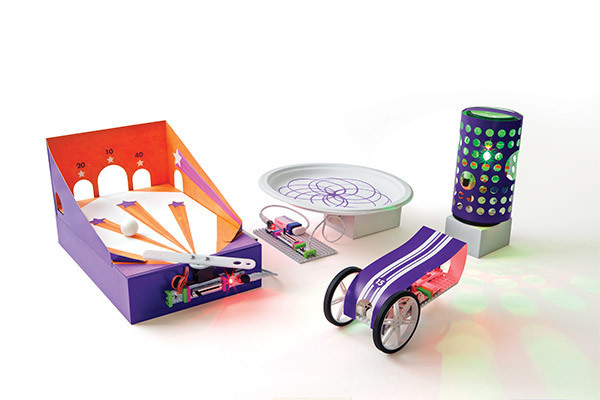 Thank-you again to Korg and littleBits for their assistance with judging as well as for supplying the prizes. 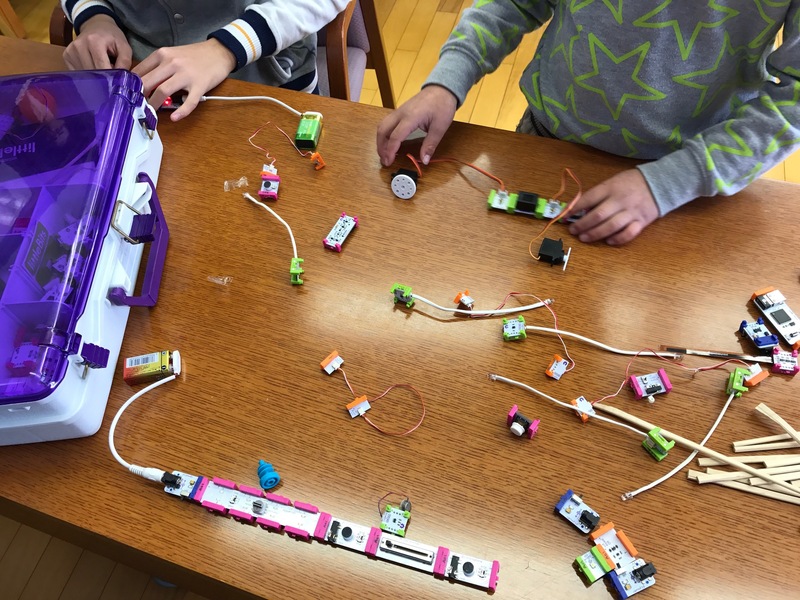 Runner Up – Coding for Life Prize for significant technical coding challenge goes to GuriiEcoGames who have won the littleBits Space Kit and the littleBits Base Kit. Runner Up – Arcade Gamer Appeal Prize for ability to draw people in to play everyone’s game goes to Team Mallaborema who have won the littleBits Gizmo and Gadgets kit. 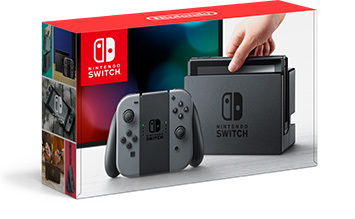 Also, a very big congratulations to Mr. Shibata who beat the odds in a raffle of 45 gamers who completely filled their stamp passports for the entry to win a Nintendo Switch! Judging for the Playoffs was extremely tough as every single team put in a huge effort and came up with interesting and fun ideas for their games. There was a bit of genius in each game and we hope this has provided more fuel to your passion to invent more and constantly stretch your creativity. In the end, the attendees chose for us through their determination to play again and again as they tried to master the game and compete with their friends. We look forward to seeing how high you may have raised the bar for next year! 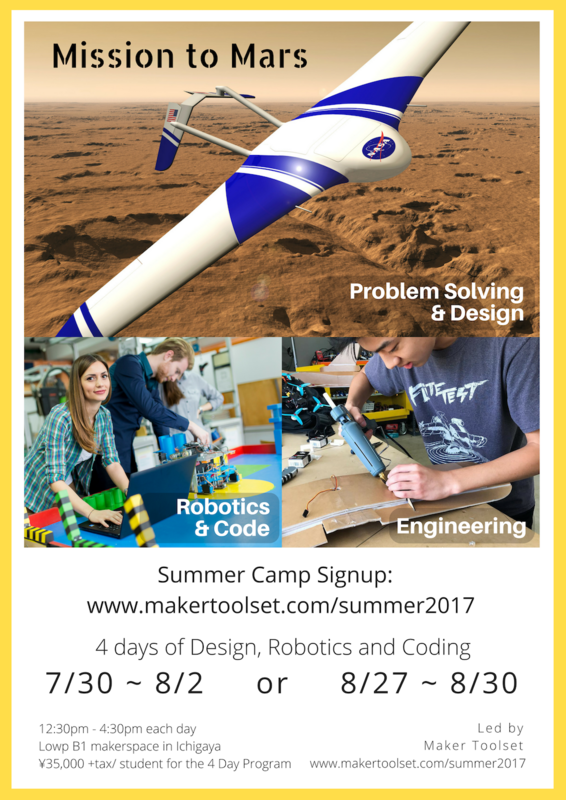 At Maker Toolset’s Pilot Spring Camp 2017 students will build 21st Century skills through design challenges using digital fabrication, physical computing, coding and robotics. 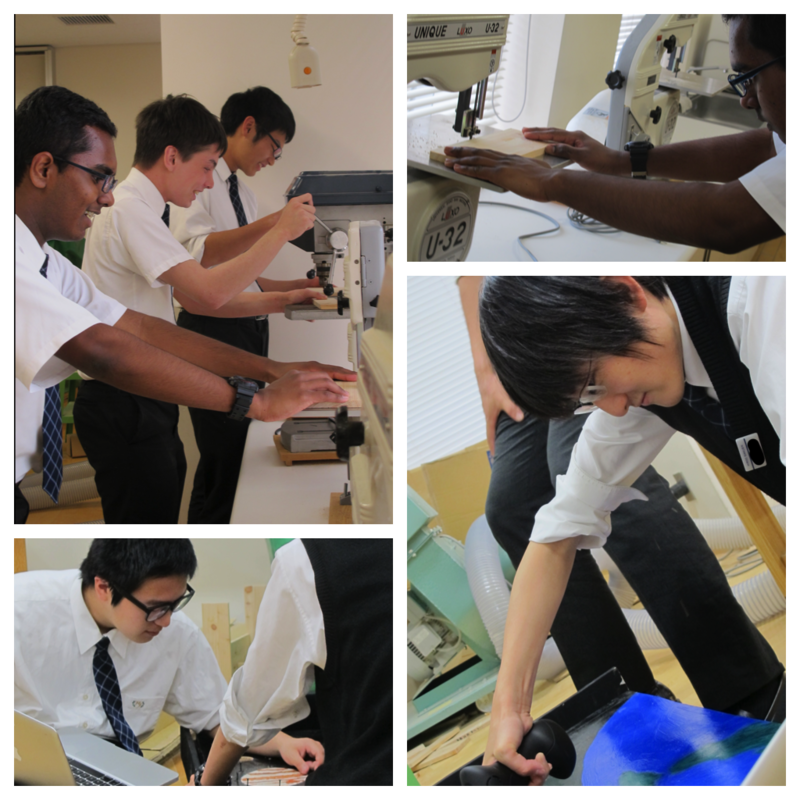 This 2-day camp is open to Jr. and Sr. High School students in the Tokyo area with the desire to learn in a primarily English environment at a fraction of the cost of an overseas design or engineering camp. Use tools like 3D pen, crafting tools, and a design cutter to construct an environment and robot shell to perform a rescue in your presented disaster scenario. 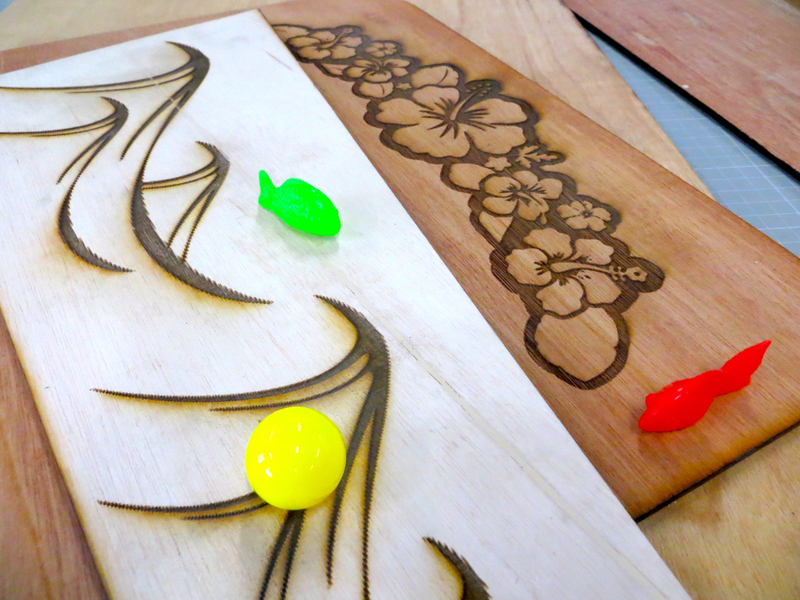 Use Autodesk 360 to design a game and fabricate it on a CNC machine. 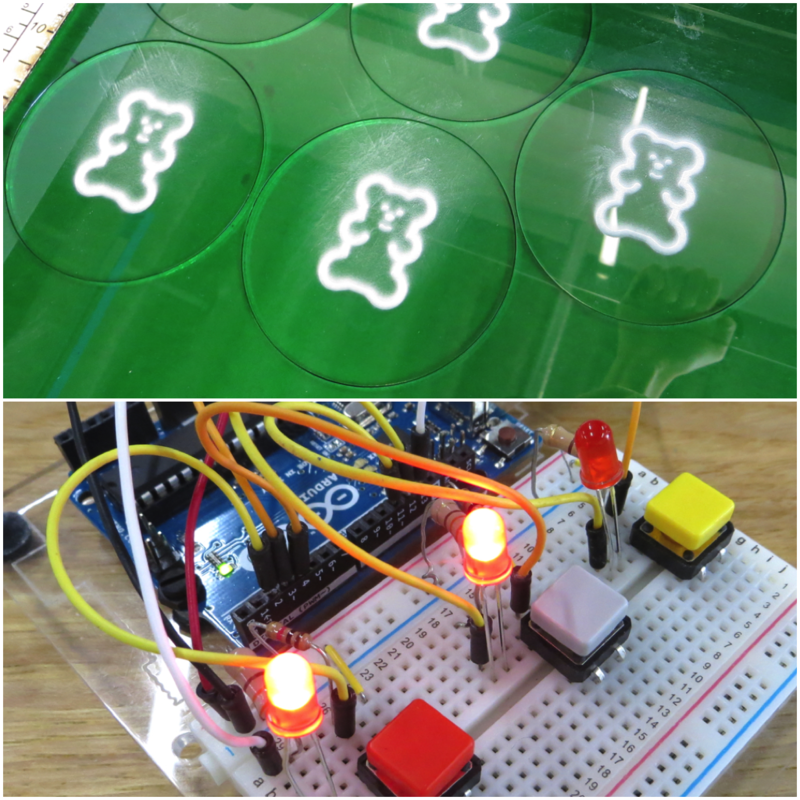 Advanced options include electronics, sensors or robotics, for added game interactivity. Design your own Valentine’s Day cards and Valentine’s gift packaging using computer controlled cutters. All materials, special chocolate treats and drinks included. Photos and video will shot during Craftech Kids to be used on the Lowp website and social media. Originally from Los Angeles, Guy is a Variety Entertainer and “Multi-Talent” who has been featured in many advertising campaigns. He works as a Creative Consultant and is the Social / Creative Director at Lowp. Guy will also have some enjoyable surprises to share at the event.